A simple to use mini wireless TENS unit that is designed to block the pain signal. Highly portable, yet powerful, this mini TENS delivers massage-like pulses to target your pain and take it away, fast. Get Your Free TENS Unit. Just Pay $7 S & H.
Prepare your skin before and after treatment with this box of 100 towelettes. Get your FREE TENS unit. Yes, this is for real. Simple to Use: Power Up. Increase. Decrease. Intensity. Convenient pain relief never felt so good. Don’t let pain stop you from doing what you love every day. iReliev’s Mini Wireless TENS Unit will help you ease the pain without having to get into your medicine cabinet. Now you can get the same therapy recommended by Doctors and used by Physical Therapists without a prescription. TENS technology is intended to block the pain signal that you feel and increase endorphins to help give you lasting relief. This drug-free alternative allows you quick and easy therapy at home, at work or on the go. 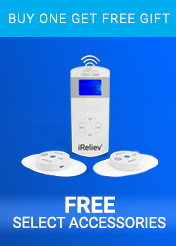 The iReliev Mini Wireless TENS Unit can be used virtually anywhere at any time. Simply turn on, adjust comfort level and let the pain melt away. The control unit is micro-sized, 2.3″ x 1″, only half an inch thick and the electrode pad is only 2″ x 3″, which makes the Mini Wireless TENS super portable and great for small or large body parts. You can even use more than one. You will be simply amazed at how powerful, portable and effective the iReliev Mini Wireless TENS Unit can be. Get yours and never have to give up your day because of pain. Who says intelligent, all natural pain relief needs to be expensive? What's in your medicine cabinet? 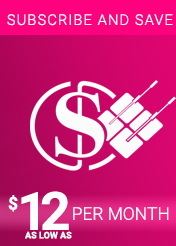 We know there are some websites out there that offer you something nice for free, but then stick you into some program that charges your card every month. This isn't one of them. We promise you. 1. It's our way of saying thank you for being a dedicated subscriber. 2. We are so confident that if you have not tried TENS before and if this is your first time, then this is a cost-effective opportunity to get one to you. Our hope is that you will want to upgrade in the future to our medical-grade versions….or even our wireless TENS EMS system, which we call the iReliev Therapeutic Wearable System that is out now! 3. Finally, we get an iReliev product in your hands and when you see how awesome it is, it should make you excited to buy other stuff from us in the future, like electrode pads and other iReliev accessories. If you proceed with this offer, you will have an opportunity to buy other iReliev products for near wholesale price at checkout! 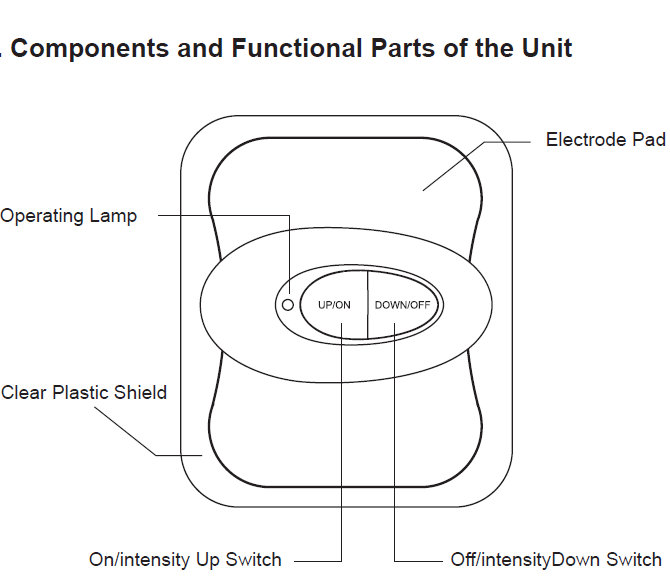 iReliev (Model # ET-0303-1) is powered by 1 lithium coin cell battery (CR2032 replacement). 10 intensity levels and 60mA output strength to pinpoint just the right intensity for both acute and chronic pain symptoms. We made this device simple. With one electrode pad, you have everything you need to find the relief you deserve. 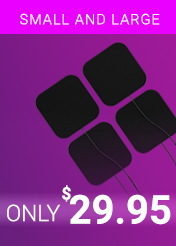 Electrode pad can be used up to 30 times. 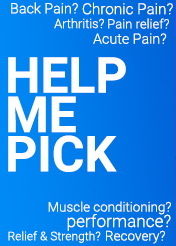 With only one program, quickly target your pain with our on-the-go-therapy. Do not use this mini wireless TENS unit if you have a cardiac pacemaker, implanted defibrillator or any other implanted metallic or electronic device. This product is not suitable for people with heart rhythm problems. Do not use this mini wireless TENS unit if you have undiagnosed chronic pain otherwise. Do not use mini wireless TENS unit if pregnant or in labor. Not suitable for children under 16 years of age. Keep out of reach of children. Please see mini wireless TENS unit users manual for additional warnings and cautions. Individual symptoms, situations, circumstances, and results may vary. Please consult your physician or qualified health care provider regarding your condition for appropriate medical treatment and the use of our mini wireless TENS unit. The information provided is not intended to be used for medical diagnosis or treatment or as a substitute for professional medical advice. You understand this to be an expression of opinions and not professional advice. You are solely responsible for the use of any content and hold ExcelHealth Inc. dba iReliev Products. and all members and affiliates harmless in any event or claim. Does iReliev Electrode Pads Made with Gel Contain Salicylate? iReliev gel pads do not contain salicylate which is necessary for many people seeking to follow protocol consistent with Guaifenesin protocol. Considered by many as an unapproved treatment for fibromyalgia suggested in the 1990s by R. Paul St. Amand. The protocol involves three parts: titrating the guaifenesin dosage, avoiding salicylates, and following a low-carbohydrate diet if the patient is hypoglycemic. Will sweat prevent electrode pads from adhering? Sweat could cause the electrode pads to lose adhesion. However, many of our customers use kinesio-tape or sweat bands to prevent sweat from being saturated into the electrode pads. Consider taping around the mini tens to prevent sweat from dripping into the electrode pad area of your body when applied. Can I use iReliev if I have a pacemaker? No. iReliev should not be used if you have a pacemaker, defibrillator, or any implanted electronic device. Also, iReliev should not be used if you have any implanted medical devices containing metal. Can I adjust the intensity? Yes, since pain is subjective, all iReliev devices provide adjustable intensity allowing you to customize your therapy as to whatever feels comfortable for you. What type of battery does the Mini TENS use? Can I use iReliev in conjunction with topical pain rubs or gels? Topical pain creams, rubs or gels can be used before or after the use of iReliev TENS and/or EMS. Please note, topical pain creams should not be applied to the site of pain immediately before applying the iReliev electrode pads. Applying topical pain rubs in combination with the iReliev electrode pads may damage the electrode pads and prevent you from experiencing optimal electrotherapy results. However, many of our customers use gel for optimal electrical dispersion. It can increase conductivity, creating a more comfortable experience while hydrating the moisture of the gel on the original pads. 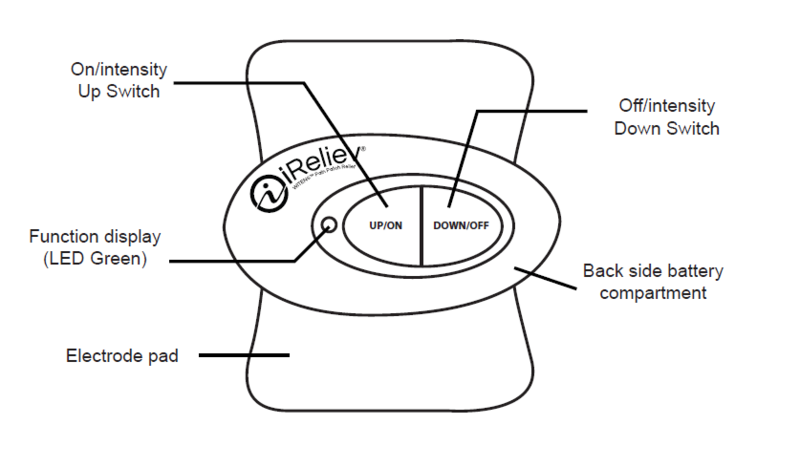 How does iReliev TENS help reduce pain? Can I use iReliev while pregnant? Do not use during pregnancy or if you think you might be pregnant. Do iReliev products require a Doctor’s prescription (RX)? Nope. All iReliev devices are FDA cleared over-the-counter (OTC) devices. This includes our latest PlayMakar ET-5050 system, a high output, wireless system. How long can iReliev TENS and/or EMS be used in a day? Therapy sessions can last 60 minutes or less. You can use iReliev for consecutive 60-minute sessions according to your pain relief needs when used in accordance with the user manual. why i should use this device? It's mini size portability and 60mA power for its size makes it unique and beneficial for anyone seeking pain relief. Is it necessary to use electrode gel with this device? No, it is not required as the electrodes are pre-gelled. Can the intensity selections be manually adjusted during the sessions, or do you have to reset it to get it just right? Yes, you can change it during a session. Best way to adjust to a comfort level actually.